Open The Book is an interactive way of introducing the children to engaging and interactive Bible stories. 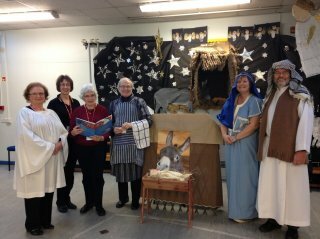 A team of volunteers from the church community visit the Primary school with resources to deliver an assembly. Sometimes the children prepare the resources such as bricks for the walls of Jericho, sometimes the volunteers make camels and hopping insects for the children to use as props. Through role play, the children become actively involved in the story and often there are responses for the whole school to join in with. Each week there is a story, a time for reflection and an opportunity to pray. So far the feedback from the children has been very positive and they enjoy the assemblies.